Going From "We Are the 99%" to "We Are the 100%"
The missing ingredient is our incentive system. Last week, I penned my own take on the Occupy Wall Street movement. My thesis was simple: Humans are hardwired to detest inequity. What's a feasible way to empower change? Ensuring financial literacy for all. Of course, a financially literate citizenry is only the first step. What, then, comes next? Let me offer one area for consideration. In talking about how we evolved as human beings -- to live in a tribal society -- I quipped: "When there's a drought, everyone -- from tribal leader to newborn -- must cut back on food. It's not that it would be cruel not to feed others in your tribe. It's that it would be suicidal." Helping one another wasn't some warm and fuzzy concept we once had but have now lost. Human beings weren't better people back then, nor are we worse people now. It's simply that for the vast majority of our history (as tribal people), our interdependence was crystal clear. The incentive to look out for others was powerful. Though this incentive is still valid, all of us -- the 1-percenters and the 99-percenters -- are essentially blinded from it. The rich and the poor, metaphorically and geographically, live in different worlds. Our interdependence doesn't stare us in the face like it used to. It wasn't until the latest financial crisis, when 99% of taxpayers helped bail out some of the richest 1%, that this dependence became so obvious. As Charlie Munger has often reminded us, "Never, ever think about something else when you should be thinking about the power of incentives." If people are serious about reforming the way Wall Street does business, incentives must be front and center on their list of priorities. I'm going to posit something that a lot of people won't like: Many of the people who helped bring the financial system to the brink of disaster did so not because they were evil or incompetent, but because they were incentivized to do so. Although it's understandable to seek vengeance on those who did act fraudulently, we could do ourselves a big favor by instead focusing our energy on changing the system that created this mess. Here are three areas where our incentives led the system astray, and where changes can be made. In 1999, with the repeal of the Glass-Steagall Act, the ground shifted underneath the feet of the banking industry. Before, commercial banks (think "Mom and Pop Savings Bank") accepted deposits and made relatively safe loans. Investment banks (think Goldman Sachs), on the other hand, were able to raise funds by issuing securities and were somewhat riskier. After 1999, the wall between the two came down. 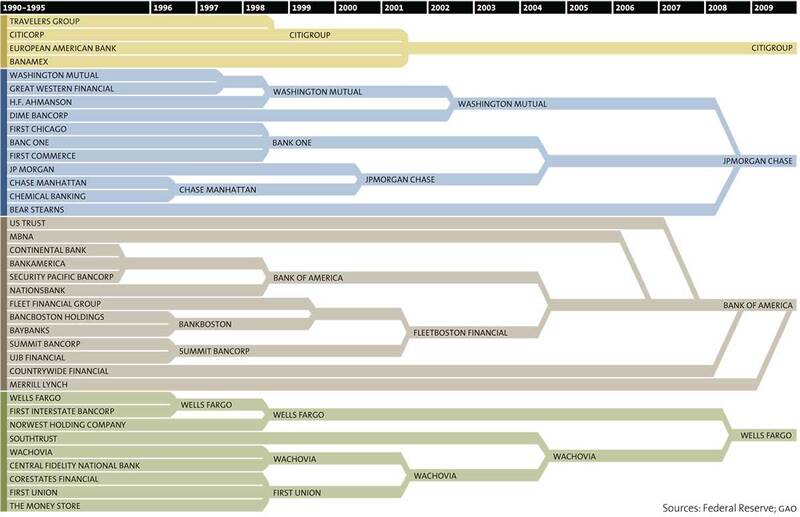 What's happened to the banking landscape since? Take a look here to see how Bank of America (NYSE: BAC), Citigroup (NYSE: C), Wells Fargo (NYSE: WFC), and JPMorgan Chase (NYSE: JPM) came to be "too big to fail." Don't believe this repeal was a big deal? Back in 2009, the Fool had a Sweet Sixteen bracket trying to figure out what caused the financial meltdown. The winners: those who repealed the Glass-Steagall Act. Why was anyone willing to buy toxic bundled mortgages in the first place, or insure them as AIG (NYSE: AIG) so fatefully did? The answer lies with the credit ratings agencies, particularly McGraw-Hill's (NYSE: MHP) Standard & Poor's, and Moody's (NYSE: MCO). Besides the fact that it's pretty clear these agencies oftentimes had no idea what they were rating as AAA investments, they were incentivized to give positive ratings. Here's a simple example: The "Bank of Bad Loans" (BOB) might bring Moody's a bundle of mortgages to be rated. BOB wants to sell the bundle -- it knows the loans are bad. But BOB can't do so until it can convince a buyer -- the "Bank of Awful Decisions" (BAD) -- that they are quality mortgages. BOB needs its bundle to get a AAA rating. Even if Moody's understands what it's rating, it is incentivized to give positive reviews. Moody's is paid by BOB, not BAD. Understandably, Moody's wants BOB's business to keep coming back so it can continue rating these bundles. Finally, I'll step into a more precarious realm. I believe that if investors (individual and institutional) were more incentivized to pick stocks for the long, long haul, capital would be more efficiently allocated. It's true that our capital gains tax system is designed to incentivize investing for at least a year before selling. Here's how a gain of $10,000 from a sale of stock currently looks (assuming the maximum 35% tax bracket). That's certainly a big difference, and you'd think it would motivate long-term investments, but it simply isn't enough. Consider what fellow Fool Ilan Moscovitz dug up: Back in 1960, the average holding period for a stock traded on the New York Stock Exchange was 100 months. But by 2007 the average holding period was just nine months! What if our capital gains taxes looked like this, using the same example as above? Am I certain that these are the solutions we're looking for? Have I played out every conceivable consequence of these suggestions? Absolutely not. Instead, I offer up these three ideas as a starting place. Clearly, people are angry. A lot of anger is directed at a vague group of people. While that anger is understandable, I don't think it will improve things unless we take a long hard look at our incentive systems. Over the long haul, and a large enough sample size, we all function based on those incentives.